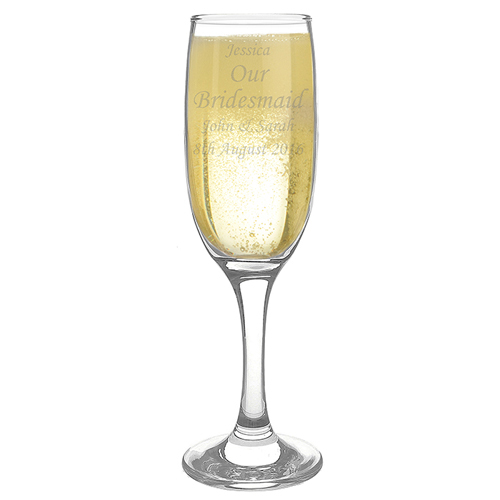 This personalised message flute is perfect for any occasion as you choose the part of your message that is engraved in bold! Personalise this elegant flute with 5 lines of text (14 characters for line 1,4, and 5 and 12 characters for lines 2 and 3 which are in bold text). If smaller words are used in your message over one line these will appear larger on the glass when the text is formatted and centralised. Please note - we are unable to support special characters or accented letters, please refrain from entering these within your personalisation. The font used within this design may become unreadable if your required text is entered all in block capital letters. Personalise with 5 lines of text (14 characters for line 1,4, and 5 and 12 characters for lines 2 and 3 which are in bold text).